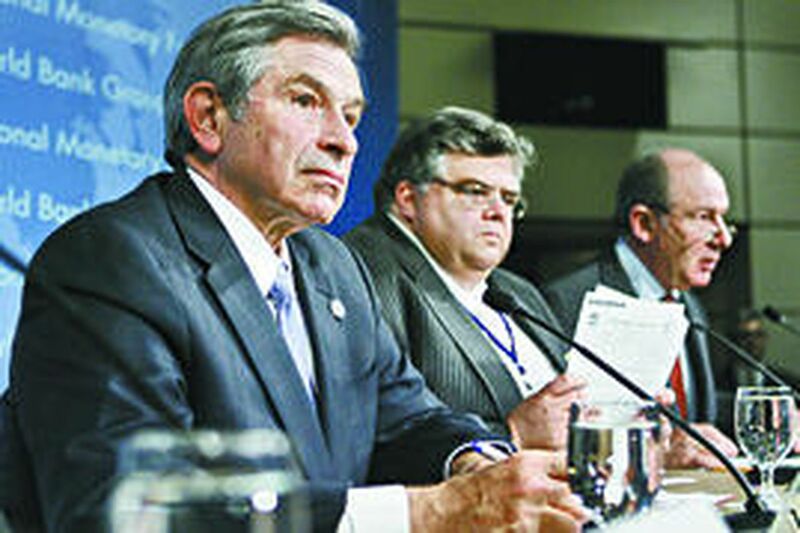 World Bank president Paul Wolfowitz (left) has been embroiled in a scandal over a job reassignment for his girlfriend, generating calls for him to resign. Do no Bush officials ever take responsibility for their actions? In an administration that brags about its moral clarity, it appears that none of the senior officials had parents who taught them to fess up when they did wrong. Take Attorney General Alberto Gonzales, who claimed dozens of times in last week's Senate hearings that he couldn't remember his role in firing eight federal prosecutors. Then Gonzales had the chutzpah to say, "I believe that I continue to be effective . . ."
Or take architects of the Iraq war, such as Donald Rumsfeld, who have moved back to private life. Has Rummy ever apologized for sending too few troops to war, or jesting about the Baghdad looting that set the stage for today's chaos? What a silly question. But the case that really gets my goat is that of Paul Wolfowitz, the intellectual force behind the Iraq debacle. In 2005, he moved from deputy secretary of defense to a cushy post as head of the World Bank, where his signature issue was a crusade against third-world corruption. Now Wolfowitz is under fire for dictating a huge pay raise and promotions for his girlfriend, a bank employee required by conflict-of-interest rules to take an outside job during his tenure (she was seconded to the State Department). Since she took her new job, Shaha Riza's pay has jumped from $133,000 to $194,000 - $7,000 more than Secretary of State Condoleezza Rice makes, according to the Washington Post. But, unlike Rice's salary, Riza's is tax-free. And by the time Wolfowitz's five-year term is set to expire, Riza would be guaranteed almost $245,000 a year. Wolfowitz also brought in a couple of close aides from the Pentagon with no experience in development banking, who are pulling down around $250,000 a year tax-free. Even at the World Bank, where salaries are notoriously high, these deals shocked bank staffers. But Wolfowitz apologized reluctantly only when his sweetheart's deal became public. He seems to see no link between leading the fight against third-world corruption and setting a personal example at the bank. "I believe in the mission of this organization," he insisted, resisting calls from World Bank staff and some bank officials to resign. Perhaps Wolfowitz thinks his personal morality is so unassailable that it doesn't matter if he bends or breaks the rules. The bank's board is pondering his fate, but of course, President Bush strongly supports keeping him on the job. Well . . . you certainly could make the case that his gross misjudgments on Iraq disqualify him for the bank job. Wolfowitz told me in an interview in November 2002, "The one risk that strikes me as just totally exaggerated out of all proportion is the so-called risk of instability when Saddam goes." He said postwar Iraq would be like "post-liberation France." He told Congress that Iraqi oil money would pay for the war. Etc. etc. Wolfowitz also presided over the Iraq reconstruction effort - which has been riddled with corruption - in which enormous sums were paid out to U.S. contractors for projects that failed or were never completed. A look at the Web site of the Special Inspector General for Iraq Reconstruction (http://www.sigir.mil), who is investigating many of these deals, will make you ill. Hardly a glowing recommendation for the presidency of a development bank. I will admit I thought when he got the World Bank job that Wolfowitz might, just might, follow in the steps of Secretary of Defense Robert McNamara. The latter left his post during the Vietnam War to become president of the World Bank. McNamara sought expiation for his mistakes by waging a battle against global poverty, and I could envision Wolfowitz doing the same. But this World Bank president doesn't admit to mistakes in the conduct of his war. As for his anticorruption campaign, his high-handed style undermined it. He is using the same unilateral tactics at the bank that keep tripping up the Bush team: concentrating power in the hands of a small, secretive team of advisers who won't listen to dissenting opinions. Such tactics - no matter the cause - are real losers. In the end, the Wolfowitz scandal provides a case study of why the White House is in such trouble. When you believe you are above the norms of the hoi polloi and need explain yourselves to none; when you brook no challenges to your fixed beliefs, you're unlikely to see disaster coming until it is upon you. Even today, the White House has yet to grasp the fatal flaws of this approach. Wolfowitz, despite the pressure, doesn't appear to get it, either. Like his former boss, he will cling to the belief that he is right, even as much of the World Bank staff demands his dismissal. And if he's ousted, he'll blame everyone but himself.